If you still need proof that bacon has become more popular than the Jonas Brothers, you only need to look at the latest fashion craze to hit Switzerland. Besides skyrocketing bacon prices, bacon-flavored ice cream and other indicators of bacon’s resurgent personality, it appears even the world of fashion is not immune to the irresistible allure of this delicious, delicious salty satisfaction of awesomeness. Normally, we associate the Swiss as masters of super secret banks, quality watches and Roger Federer. But perhaps we should be changing our tune to calling Switzerland the “bacon scarf” capital of the world, a title I doubt that other country wants. In addition, this alpine country has made a name for itself for turning raw chocolate into some of the world’s tastiest chocolate morsels and indeed, the phrase ‘Swiss chocolates’ brings all sorts of sweet memories to our chocolate obsessed staff. Yes, if there is anything the Swiss know, they know how to transform stuff and make them badass. Swiss designer, Natalie Luder, has hit the ball out of the park by demonstrating the Swiss’ ever-discriminating eye for quality and precision manufacturing to Asian silk. From raw bolts of woven silkworm casings, Swiss designer Natalie Luder crafted bacon scarves that look just like the real thing. No word on whether they taste or smell like it too. In fact, these scarves look so genuine, you’re tempted to buy an “egg over easy” or “brown toast scarf” to go along with these nifty pork dish wraps. The secret? High attention to detail. 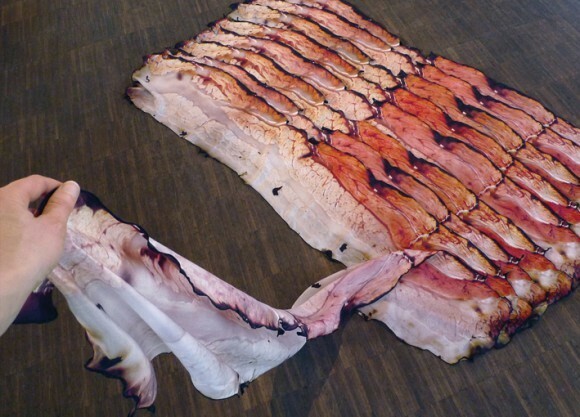 Luder’s bacon scarves look so real and are cut to fit the exact shape of bacon slices that Luder insists that there is no meat flavor to her scarves. Darn. Oh well, can’t win them all. Maybe if she did add fake bacon taste to the scarves, the people wearing her scarves could get some calorie-free licks or bites on their scarves. Leave it to the Swiss to figure out a way to make bacon cholesterol, fat, salt, and calorie free. Anyway, I digress… I’m just too busy wiping the drool off my chin. If you enjoyed this article, be sure to follow us on Facebook and Twitter!